First, who are the 505 idiots who voted for Carl Lundin? He’s the guy who dropped out. We’ll call that the “ignorant voter” quotient. Second, the two candidates who identify themselves as Conservatives, Mary Weigand and Monte Schmiege, won convincing pluralities. Schmiege is an incumbent and one of two conservatives on the current board. Weigand is a well-known local conservative. This is, perhaps, not surprising in a conservative community like West Bend, but the results of the past few local elections seemed to indicate a softening of that demographic feature. This election seems to indicate that perhaps the previous elections were anomalies. 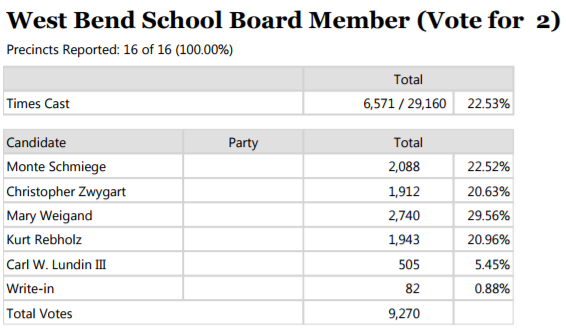 Third, turnout for this primary election was 35% higher than the general election last year for school board (22.53% vs. 16.68%). This is a pattern that we have seen in West Bend for a while. There is a vocal, committed, organized liberal minority. They vote more reliably than the conservative majority. This means that turnout is everything. When turnout is below 20%, liberals can win victories in local elections like they did last April. When turnout is higher, there just aren’t enough liberals to overcome the conservative vote. The liberals can turn out every single liberal in the county and they can’t win if there is even a moderate conservative turnout. It’s just math. Let’s hope that turnout is decent for the April election. Given that the Supreme Court race is likely to be very heated, I think Schmiege and Weigand have the inside track to the school board. That bodes well for the district.